The year about to conclude is the ninth consecutive year of expansion in the world economy, an expansion that emerged with a delay in Europe and even more so in Italy. World trade is beginning to display the initial effects of the protectionist war between the United States and China. The Report on Recent Economic Developments for October 2018 that Italy is showing signs of a cyclical slowdown, with the gradual weakening of the recovery, which is weighed down by growing uncertainty and the substantial risks of a deterioration in international economic conditions. The trade war is beginning to have an impact, but this is just the beginning – The global expansion is continuing, albeit with developments differing from country to country. 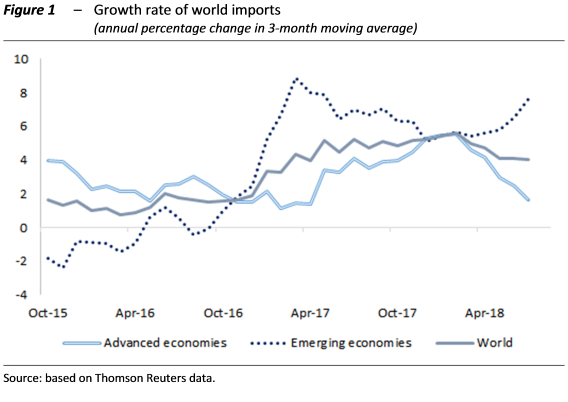 World trade shows clear signs of slowing, reflecting the early protectionist tensions triggered by the measures of the Trump administration, which then spread to China and Europe (Figure 1). 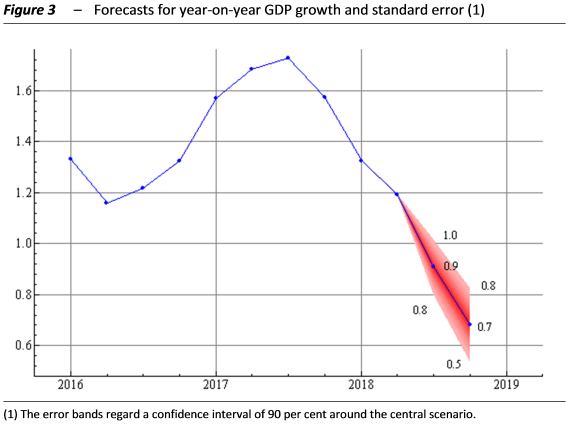 This situation has prompted all the international organisations, beginning with the IMF, to revise their forecasts downwards for both the advanced countries and the emerging economies: compared with the July forecast, the projection for the world trade growth has been lowered by 0.6 points this year and 0.5 next year. The GDP growth forecast has been trimmed by 0.2 points in both years. According to the simulations conducted by the IMF, the effects of the trade war so far between the United States and China would be small in the short term, reducing GDP growth by a few tenths of a percentage point, but in the long term the adverse impact could rise to 1 percentage point for the United States and six-tenths of a point for China. The assessment of the macroeconomic impacts of protectionism should consider the considerable integration of production in the various countries. Trade restrictions lead to generalised welfare losses, both for countries that protect themselves with barriers and for their trade partners. The protected national industries could gain a temporary advantage, but in the long term they would also be affected by the general macroeconomic weakening of economic activity. The Italian economy loses steam and uncertainty grows – Economic activity slowed down in the first half of the year, reflecting the weakness of foreign trade and despite a sharp increase in investment. The most recent economic indicators show growing signs of a deceleration, especially in industry, which posted virtually no growth in the summer quarter. 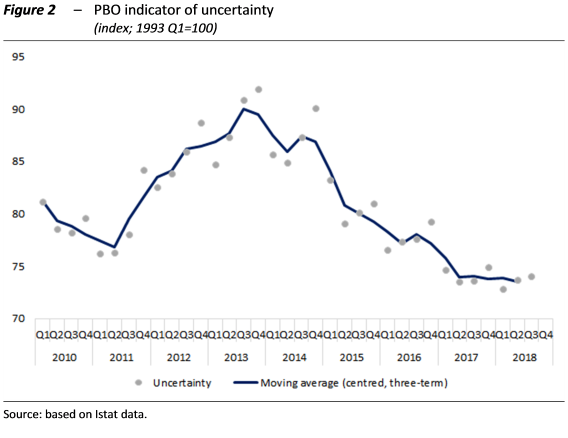 The PBO diffusion index, which measures the spread of the recovery to the various manufacturing sectors, is continuing to decline and is now below the threshold of 50 per cent. Uncertainty is beginning to weigh on the confidence of households and firms: the PBO indicator, while remaining at historically low values, posted its second consecutive rise in the summer (Figure 2), mainly driven by the sub-components of the index connected with industry excluding construction and services. Growth slows while risk factors worsen on the horizon – The weakness of economic conditions is reflected in the estimates produced using the PBO’s short-term models, which for the third quarter anticipate a GDP growth of 0.1 per cent (within a symmetrical confidence band of between 0.0 and 0.2 per cent), reflecting the volatility of the industrial cycle and the uncertainties in international developments. In the final quarter of the year, output is projected to expand by the same amount as in the third quarter, although with a wider band of uncertainty (Figure 3). These developments would produce a GDP growth of 1.0 per cent for 2018 as a whole. Considering that this year has three more business days than 2017, adjusted annual growth could amount to 1.1 per cent. The PBO therefore confirms the projection for 2018 produced as part of the endorsement exercise for the macroeconomic scenario presented in the Update to the 2018 Economic and Financial Document, which was slightly lower than the Government’s projection. Expectations for slow growth in the second half of 2018 also affect the carry-over on next year, which on the basis of the forecasts for this year would be very low (0.2 per cent). Significant and growing risks connected with fears of the emergence of adverse conditions are weighing on short- and medium-term forecasts. The international scenario is affected by uncertainty about protectionist developments and trends in energy commodity markets. Sudden increases in risk aversion on the financial market operators remain a threat, which would have a rapid impact on the macroeconomic conditions of the Italian economy.